Sweet Kiss Return is Peach's Defensive Power Shot in Mario Power Tennis. 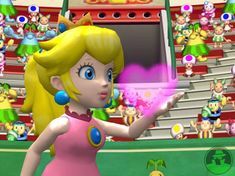 Peach blows a sweet kiss at the ball, causing hearts to appear and carry the ball back to Peach so she can hit it. After it is used, the ball is lob shot across the net with a bit of speed. This is one of the Defensive Power Shots which never has a chance of missing the ball if it's out of the player's reach.